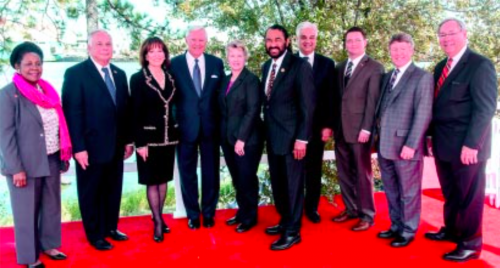 Officials present at the Houston Ship Channel 100 years Celebartion were Congresswoman Sheila Jackson Lee, Congresman Gene Green, Port Commission Chairman Janiece Longoria, Mayor Annise Parker, Congressman Al Green, Commissioner Jack Morman and Judge Ed Emmett with Port officials. 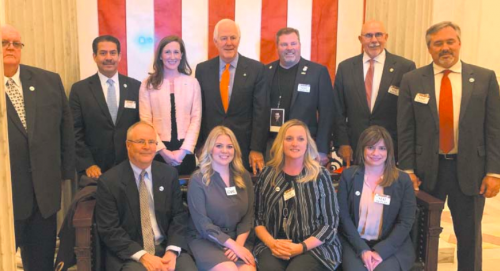 Houston, TX – On Monday, November 10, 2014, local and elected officials celebrated a centennial of success during the Houston Ship Channel’s 100 Year Rededication Ceremony. HSC was formally opened in 1914 under the salute of President Woodrow Wilson’s cannon after a long history that dates back to the 1830’s. A ceremony and parade to open the channel, a long-sought accomplishment, was held on November 10, 1914. One hundred years later, Houstonians are gathering to celebrate the Channel with the same enthusiasm this Monday, November 10th. The Houston Ship Channel continues to support the livelihood of the city and its people, serving as home to one of the largest petrochemical complexes in the world. The Port of Houston is also the nation’s leading port in terms of foreign tonnage. The City of Houston has been elevated to energy capital of the world thanks to the jobs and economic growth spurred by businesses on the Channel. Houston, which was once established as a landing place at the head of the Buffalo Bayou has now become one of America’s leading cities and home to one of the busiest waterways in the world.